Veneers cover the front of the tooth surface and slightly wrap around the sides and biting edge of the tooth. In most cases, each tooth receiving a veneer will be carefully prepped prior to the veneer fabrication and placement. This preparation involves removing a thin (usually less than one millimeter) layer of enamel from the natural tooth in the areas that will be covered by the veneer. This allows the veneer to fit seamlessly with the contours of the natural tooth. The veneers are attached using a thin but strong bonding material. The material hardens when cured by a specialized laser. Porcelain Veneers – Porcelain veneers are the longest-lasting and most aesthetically-pleasing type of veneer. They are created in a lab to the exact specifications of the dentist and mimic the look of natural enamel, using multiple thin layers of porcelain. The size, color, shape, and fit are fully customized. 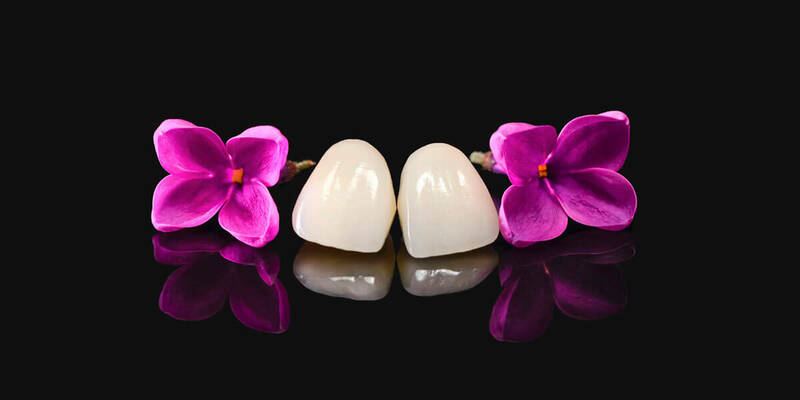 Composite Veneers – Made using composite resin, these may be made in the dental office or in a dental lab and are less expensive than porcelain veneers. They can alter the appearance of tooth color, size or shape and can be an effective solution for less extensive cosmetic improvements. They are fully customized as are the porcelain veneers but the composite material is somewhat susceptible to staining and does not last as long as porcelain. Instant Veneers – Prefabricated resin veneers are not customized to the shape and fit of your tooth but they do come in many different sizes and shapes. The doctor will help patients select the color and shape that is best suited to their smile and overall coloring. Because there are fewer appointments and no lab fees, this solution is much more affordable than porcelain or composite veneers and can often be done in just one visit. Instant veneers do offer some stain resistance but do not provide the same quality, durability, or appearance as porcelain veneers. Removable Veneers (Snap On Veneers) – The dentist will take an impression of your natural teeth to use as a model to create resin veneers using the desired shape and color. The veneers clip over the patient’s natural teeth and can be removed for cleaning or when they are not needed.